We love the availability of different citrus during the winter months. Blood oranges offer a stunning color to dishes. 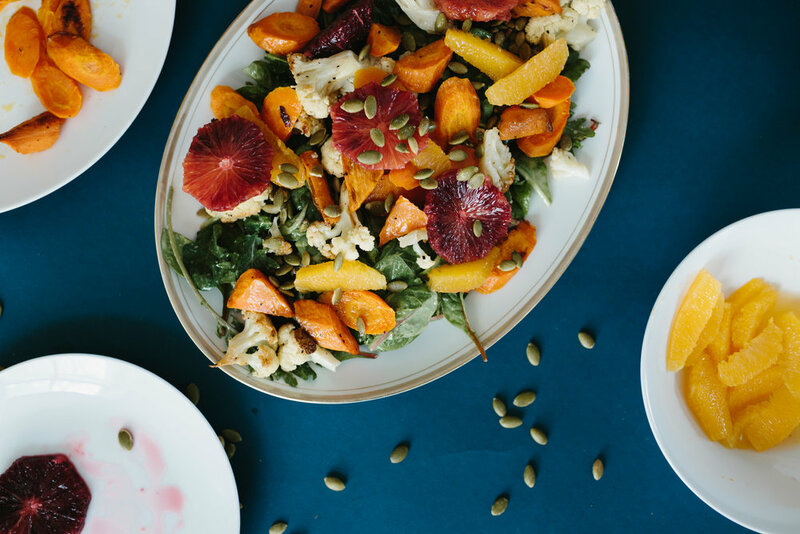 We have found Cara Cara oranges, tangerines, Clementine’s are everyone’s favorite, and even Meyer lemons can easily be found and would add a fresh tang to this dressing. Roasting vegetables is a wonderful way to caramelize them and enhance their sweetness and flavor. Mel is a self-proclaimed #1 fan of carrots. So they were absolutely going to be added to this salad. Cauliflower is readily available and stored this time of year and is really delicious when roasted. Pumpkin seeds are an excellent source of protein for vegetarians and provide a great crunch to this salad. We served a big platter of this for Mel’s birthday dinner this year. While the main course was a favorite stuffed pasta shells, this hearty salad was a huge hit. Cooked French lentils would be a delicious addition and would add more substance and protein. We wrote in an earlier blog about cooking more vegetarian dishes these days. Beans and lentils are our go to’s to bulk up any dish. We certainly don’t feel like we missed out on anything with this salad and had happy full bellies. Place carrots and cauliflower on a sheet tray, toss with 2 Tb olive oil, salt, and pepper. Roast in oven, stirring or turning vegetables a couple times for 20 minutes or until caramelized and slightly tender. When 5 minutes remain, toast pumpkin seeds in the oven on a sheet tray, giving a shake at least once. In a blender combine mustard, maple syrup, garlic, and citrus juices. Drizzle in oil until emulsified, adding salt and pepper to taste. Add water to thin out, if necessary. In a large mixing bowl, toss the greens, adding dressing to the sides of the bowl, to incorporate evenly. Start assembling the salad on a platter or individual dishes. 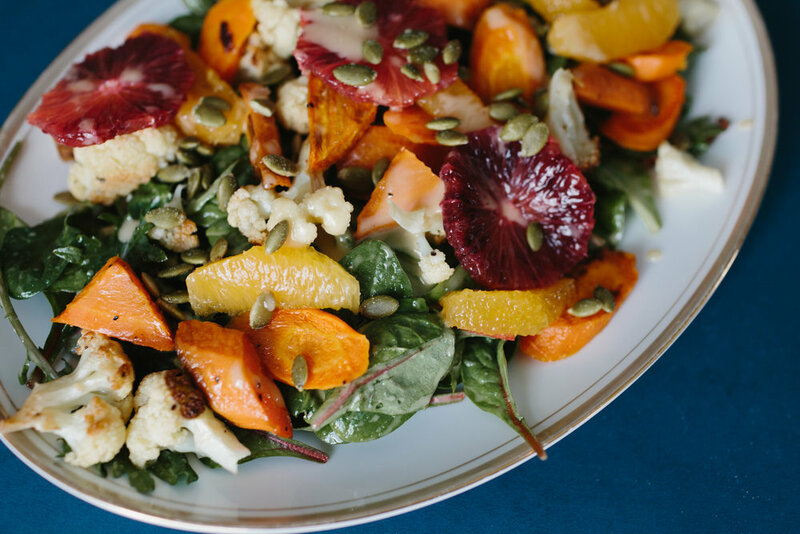 Greens on the bottom, layer on the roasted vegetables, citrus segments and pumpkin seeds. Drizzle more dressing on top and a few cracks of black pepper.